The founder of Buddhism in this world was Buddha Shakyamuni who lived and taught in India some two and a half thousand years ago. Since then, millions of people around the world have followed the pure spiritual path he revealed. The Buddhist way of life of peace, loving kindness and wisdom is just as relevant today as it was in ancient India. Buddha explained that all our problems and suffering arise from confused and negative states of mind, and that all our happiness and good fortune arise from peaceful and positive states of mind. He taught methods for gradually overcoming our negative minds such as anger, jealousy and ignorance, and developing our positive minds such as love, compassion and wisdom. Through this we will come to experience lasting peace and happiness. These methods work for anyone, in any country, in any age. Once we have gained experience of them for ourselves we can pass them on to others so they too can enjoy the same benefits. Meditation is at the heart of the Buddhist way of life. It is basically a method for understanding and working on our own mind. We first learn to identify our different negative mental states known as ‘delusions’, and learn how to develop peaceful and positive mental states or ‘virtuous minds’. Then in meditation we overcome our delusions by becoming familiar with virtuous minds. Out of meditation we try to maintain the virtuous minds we have developed and use our wisdom to solve the problems of daily life. As our mind becomes more positive our actions become more constructive, and our experience of life becomes more satisfying and beneficial to others. Anyone can learn basic meditation techniques and experience great benefits, but to progress beyond basic meditation requires faith in the Three Jewels – Buddha, Dharma and Sangha. Usually people find this develops naturally as they experience the benefits of their meditation practice. The teachings of Buddha reveal a step by step path to lasting happiness. By following this path anyone can gradually transform his or her mind from its present confused and self-centered state into the blissful mind of a Buddha. “Every living being has the potential to become a Buddha, someone who has completely purified his or her mind of all faults and limitations and has brought all good qualities to perfection. Our mind is like a cloudy sky, in essence clear and pure but overcast by the clouds of delusions. Having attained enlightenment we shall have all the necessary qualities – universal love and compassion, omniscient wisdom and boundless spiritual power – to lead all living beings to the same exalted state. This is the ultimate aim of Mahayana Buddhism. To find out more about basic Buddhism, read Introduction to Buddhism by Geshe Kelsang Gyatso. With the fast pace and high stress of modern life many people are becoming interested in the peaceful philosophy of Buddhism. In particular there is a very deep interest in learning how to meditate, both to overcome stress and anxiety, and to deepen one’s spiritual experience. In response to this growing interest Kadampa Buddhism offers many different ways of learning about Buddhism and practicing meditation. Kadampa Buddhism was first introduced to the West in 1977 by the renowned Kadampa Buddhist Master, Venerable Geshe Kelsang Gyatso. Since then he has worked tirelessly to provide all the conditions necessary to support contemporary practitioners. He has written twenty-one authentic books on Buddhism that are now being translated into many different languages. A worldwide network Geshe Kelsang has also established over 1200 Kadampa Buddhist centers and branches in 40 countries around the world where people of all cultures can train in meditation and other Buddhist practices. These centers all have qualified local teachers and offer introductory classes, structured study programs, and meditation retreats. 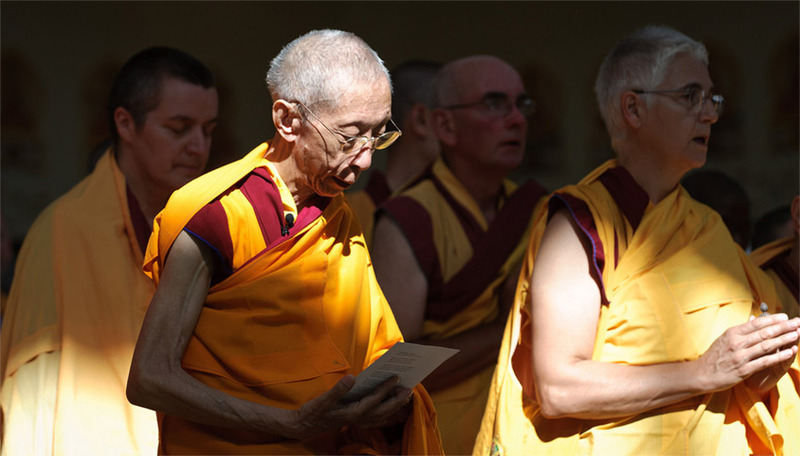 All Kadampa Buddhist Centers are open to the public.